What’s A Google Answer Box? 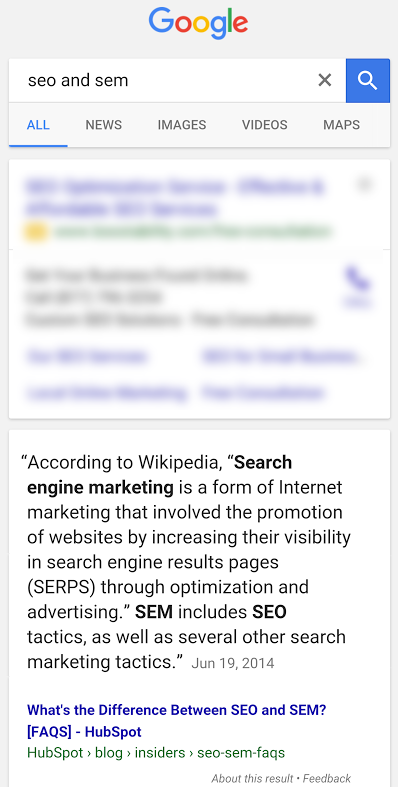 Google’s answer box is a unique SERP result that is powered by the knowledge graph or scraped from a site that provides an adequate answer. It is typically displayed at the top of the results page, but below ads. Typically, instant answers are a box with a brief text answer and a source URL. This is Google’s attempt to directly answer a query without the need for clicking a SERP result. To find out more about these nuggets of knowledge we took a look at over 40 million(!) keywords. For this set we focused on US desktop results. Of those, just under 4 million returned answer boxes. That equates to about 9.5% so the percentage of search results with answer boxes is certainly significant. This presents a great opportunity for all sites, as the click-through rate and traffic driven from these seem to be higher than the first position. It comes as little surprise that when it comes to answer box results, Wikipedia led the way by a wide margin at 15.4% of the nearly 4 million answer boxes. The health industry has good representation between WebMD, Mayoclinic, and Healthline making up 4.8% collectively. Google tells us there is more to come for health answer boxes on mobile as well. Finance has some representation with Investopedia and I imagine this industry has plenty of room for more in the future. These top 10 domains are all recognizable and are, by most accounts, logical choices as resources in their respected areas. One major way a search engine could discern that, is with linking data and metrics similar to PageRank. By taking a look at the Majestic scoring metrics for these domains we get a better understanding of why these domains appear in answer boxes more frequently than others. 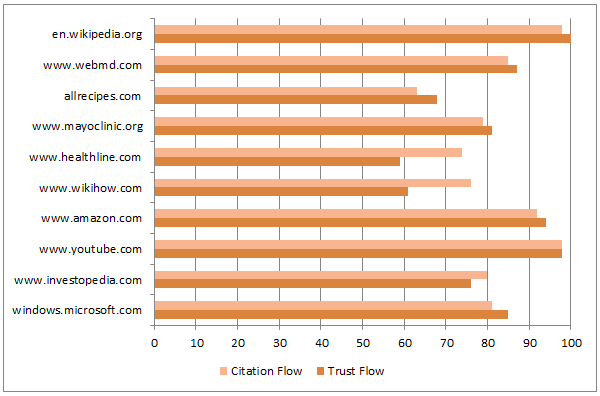 The average for both trust and citation flow for these top answer box domains is over 80 out of a possible 100. This means the Flow Ratio (CF/TF) is about two times better than the average. 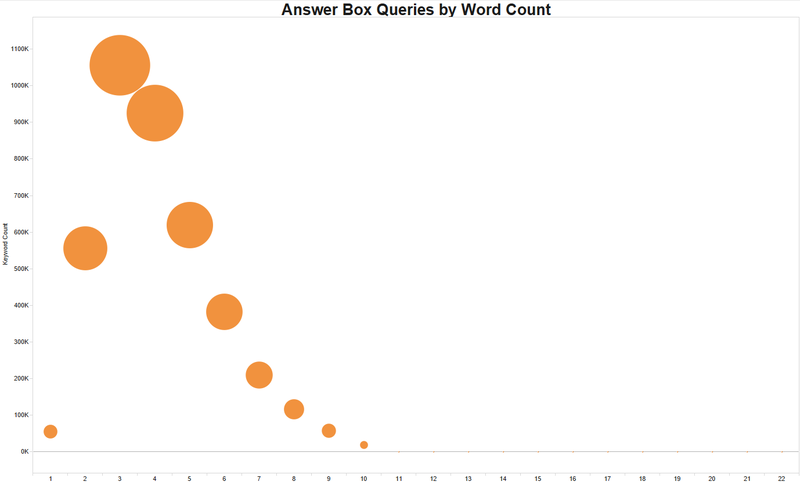 Visualizing the approximately 4 million keywords that trigger answer boxes by search volume groups shows a heavily logarithmic chart. 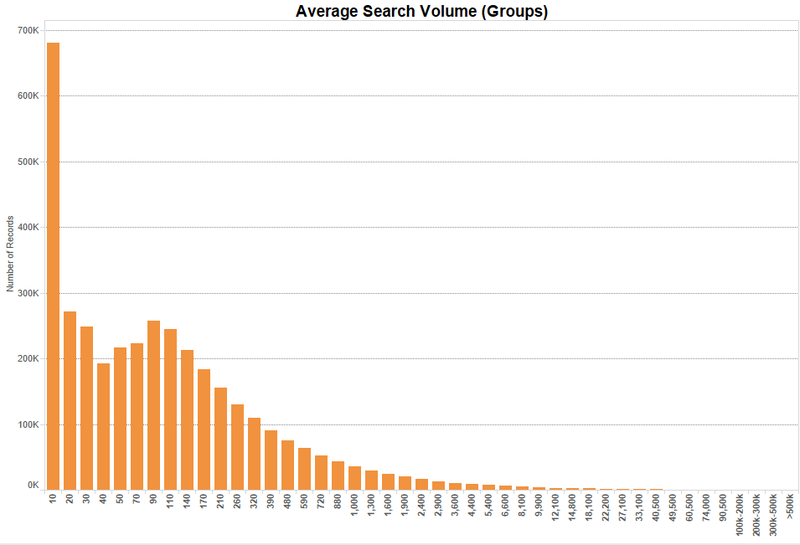 We saw occurrences of 56 unique instances of the estimated 85 keyword search volume buckets. This graph indicates that answer boxes are more frequently occurring for mid to long tail keywords, or those where the search volume range is less than 1,000. 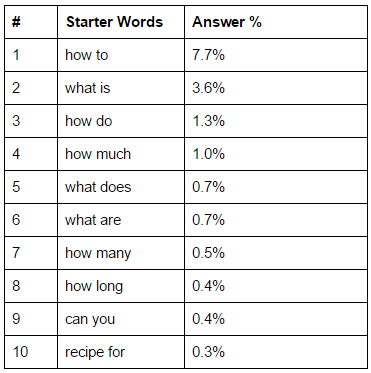 To garner a clearer picture of this, we can take a look at the count of words per query. 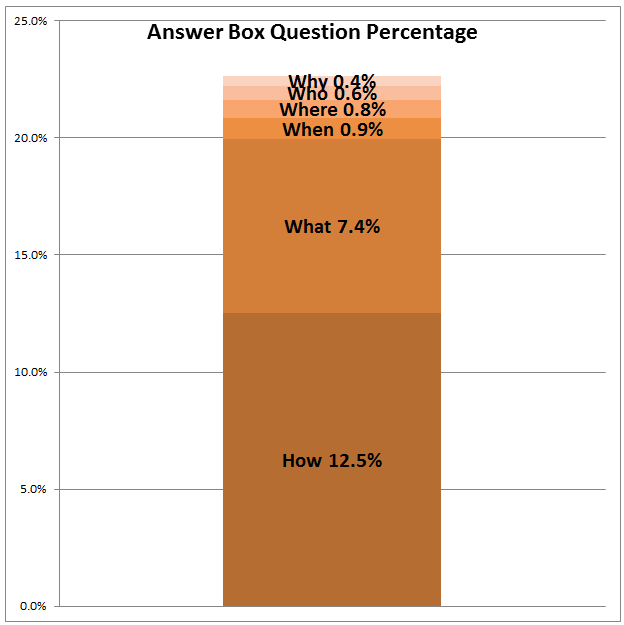 This shows us that a good majority, over 65%, of queries that display answer boxes contain between 3-5 words. This imperfect bell curve gives an idea as to what the length (in words) of queries are that trigger answer boxes. Some of these were more prevalent in domains in the health industry, such as WebMD, which saw a majority of its queries follow the pattern above where their top starter words were “how to” and “what is”. Not all domains followed this pattern though. For example, in the financial industry, Investopedia, saw a majority of its queries start with “what is” and then “definition of”. This makes it apparent that some phrases are more specific to certain industries, which makes sense logically. Are answer boxes the same between devices? Instant answer: Not always. 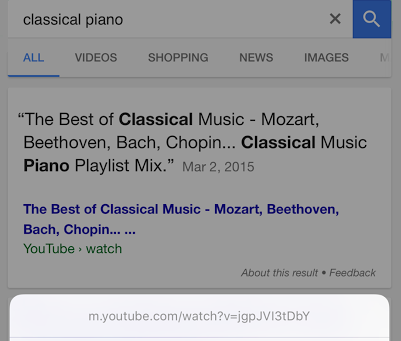 When answer boxes appear for a keyword on both mobile and desktop, more often than not they are identical. 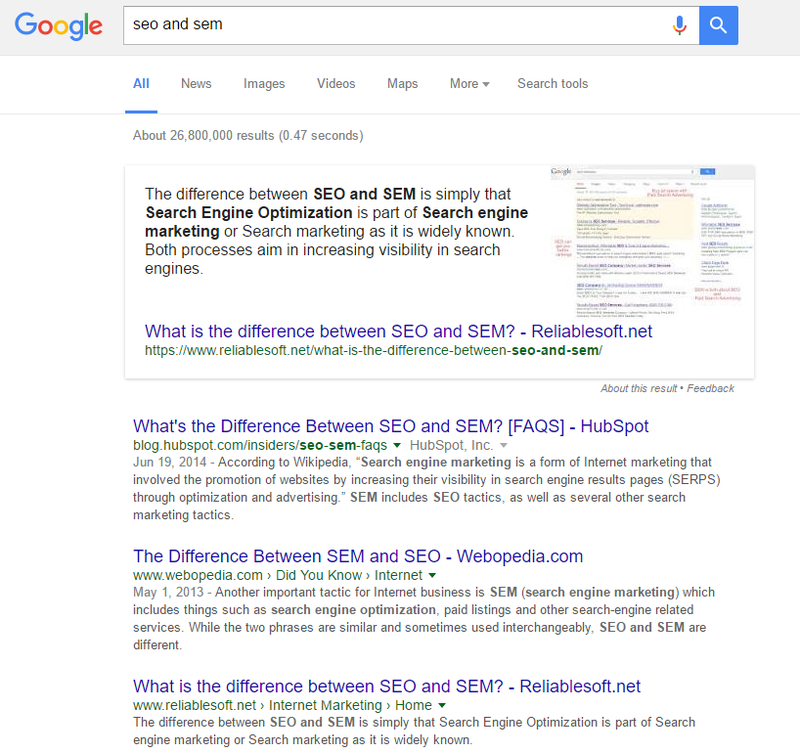 But there are exceptions, such as with the example search for “seo and sem”. The desktop answer box displays a source URL from www.reliablesoft.net, whereas the mobile answer box displays a source URL from blog.hubspot.com. The first 3 results (seen in the desktop image) are identical between devices. Is this because reliablesoft isn’t mobile friendly? Not in this case, as both URLs passed the mobile test based on Google’s mobile friendly tool. What makes this more interesting is that Hubspot quotes a Wikipedia article. While all Youtube desktop URLs displayed with HTTPS, the mobile Youtube URL (m.youtube.com) displayed as HTTP 99% of the time. These all redirect to their HTTPS counterparts though, indicating answer boxes might not be updated often. As most Android powered devices have Youtube pre-installed, this wouldn’t be as prevalently seen. Beyond that there are multiple instances of an FTP protocol used in the answer box URL. 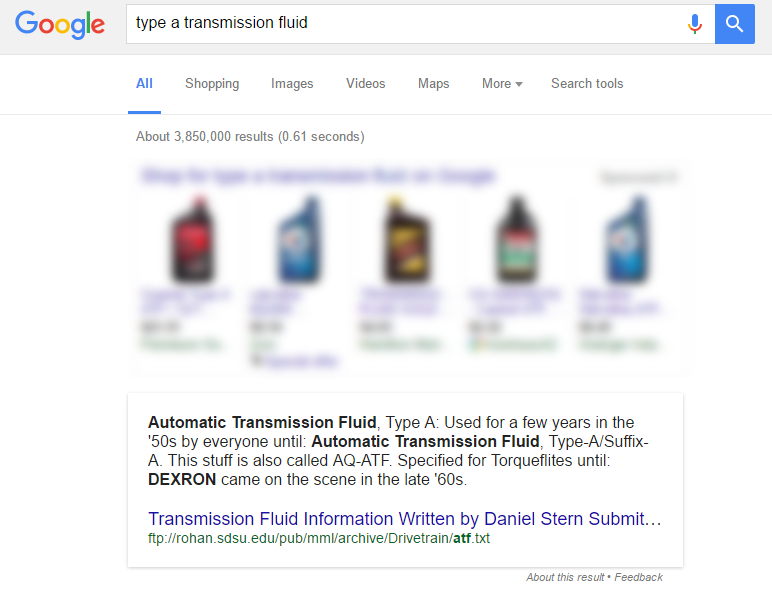 Such is the case of San Diego State University where the displayed URL is ftp://rohan.sdsu.edu/ for “type a transmission fluid” (Google US). There are also cases of IP addresses as the answer box URL. This is the case of the Canadian Revenue Agency, whose web presence is located at 198.103.185.80 and can be seen when searching for “netfile canada” on Google Canada (Google.ca). In the end, Google has logic for dictating which queries display answer boxes. Determining what it is and how it is processed isn’t as straightforward as one might think though. This logic, as we saw, is different between desktop and mobile devices. It also doesn’t have to be a traditional web URL, such as an IP address or FTP location. Video descriptions such as those found on Youtube can also be used. The frequency of answer box updates, such as the URL display, seems to vary. As a whole these should be seen primarily as an opportunity for queries where answers are descriptive and more information is needed than can be found in 2-3 sentences. Conversely, answers that are simplistic in nature likely won’t drive traffic if the answer can be viewed and understood within the SERP. This means a bit of research should go into reviewing the search query to get a perception of intent. Interested to know what keywords your domain ranks for that trigger answer boxes? Request a report!